One week ago I spoke at the Westford Symposium on Building Science. You may know it better as Building Science Summer Camp, since that's what everyone calls it. I wrote up a little summary of the whole conference last week but didn't say a lot about my presentation. Today I'll fill you in on what you missed if you weren't there. I gave this presentation with Chris Van Rite, who works for M&M Manufacturing in the Dallas area. We had given a presentation together (along with Robert Bean) at the beginning of this year at the ASHRAE conference in Las Vegas, so he got us on the Summer Camp program to discuss flex duct. He travels around Texas teaching contractors about duct systems and air flow and was on the ASHRAE committee that developed the new duct calculator showing the results for flex duct not pulled tight. After the intro, I got serious and jumped into the air flow issues with ducts. Pretty much everything in my talk is something I've written about here, so I'll point you to the appropriate articles. I began with the two causes of reduced air flow in ducts: friction and turbulence. I showed one graph (below) from the Texas A&M research on pressure drops in flex versus sheet metal ducts. What the data show is that if you pull the inner liner of flex duct perfectly tight, flex performs the same as rigid sheet metal ducts. That's not just three sets of data below; it's six. Flex and sheet metal pressure drops for 6", 8", and 10" ducts. They're the same, which means you can size flex the same as rigid...IF you pull it perfectly tight. Then I got into the Manual D duct design process, which is all stuff that's in my duct design series here in the blog. I briefly discussed available static pressure, total effective length, and friction rate. I concluded that the pressure drops of fittings dominate the process...unless you install flex like I showed in some of those photos in my introduction. Then we really don't know what's happening, but we do know that you're choking off the air flow. He wrapped up his part by showing how to use the new ASHRAE duct calculator. (He also managed to get 500 of the calculators donated so everyone at Summer Camp got to take one home.) I covered how to use the duct calculator in my duct design series, so you can check that out here in the blog. Is rigid duct the answer? Well, maybe. In our third part HVAC design here at Energy Vanguard, we design a lot of systems that use rigid duct for the trunk lines and flex for the branches. That's not one of ours below, but it's the same concept. But as with just about everything, it's not the product or the material that matters. I've got some fun photos of rigid duct systems, too. I have no idea what the designers/installers were thinking when they created this thing you see below. Flex duct systems can work great. And they really are way better for noise control than rigid duct. You just have to design and install it properly. Some people can do that, like my friends in California. Here's a beautiful flex duct system done by Mike MacFarland and his company Energy Docs. And there you have it. Based on the comments and discussions I had with people after the talk, I think we stirred things up a bit. Maybe it'll even help bring about a little bit of change. It is so good to see a product's limitations discussed without trashing the product. Some of my contractors refuse to use flex duct based on some erroneous information about it. There are times when flex duct is the right product for the application, and when installed properly, flex duct can be quite beneficial. Yep. I also know people who refuse to use flex for anything. That's their choice, and I'm OK with it. If they've heard me speak or read my stuff here, at least it should be a more informed decision. This concept of flex duct being pulled "perfectly" tight... how often do we see perfect in one of our buildings? Seems to me the robust answer would be to accept flex has to be sized a bit larger than hard pipe in order to perform the same. Am I wrong? In existing residential buildings where I live (Hot-Humid South), it seems a great opportunity to downsize air conditioning upon replacement, which addresses both some airflow and some runtime problems. Each of the trials on my own home have been successful, proving that the earlier AC units were indeed more than needed. Mark, it doesn't happen often. As you say, it's best to go up in size a bit because 4% longitudinal compression is typically about the best you can hope to see in the field. But HVAC installers need to measure static pressure, air flow, and velocity in their systems and understand them well enough to know how well a design will work. That's what MacFarland, Healy, and Perunko do in California. Others do it as well, but it's not common. I too looked upon the word "perfect" with disdain. A favorite saying of mine was, "If you think something is perfect, you aren't looking at it closely enough." I have come to reconcile use of the word by taking a somewhat different attitude about its meaning and realizing something can be perfect if "it is as good as it can be". Now I toss "perfect" about with impunity, as appropriate of course :). At what point does having a decentralized HVAC distribution system (like with mini-splits) outweigh a centralized system in overall efficiency? Is it always, sometimes, or is even contemplating this merely "flogging a dead horse" because you are always overridden by the opinion of the local HVAC contractor? I realize probably one of the greatest hurdles for mini-split technology is the homeowner not wanting to see a large unit on the wall - but we are glad to see improvements in the ceiling cassette technologies, which seem to lower the consumer cosmetic hurdle. And of course you don't even have to have the ducting conversation, whether flexible or rigid. Good question, Charles. The answer you get will depend on whom you talk to. I like ductless mini-splits. I like well-designed ducted systems, too. Both can work well. Both can be really efficient. @Charles, the problem with whole-house ductless is that the smallest heads have way too much capacity for individual rooms, especially new construction. A 6kbtu head in a typical bedroom with a load less than a thousand BTUh will over-cool the occupants during on-cycles, creating a contrast that makes otherwise comfortable ambient air feel warm by comparison during off-cycles. I refer to this as 'motel room syndrome' - the room is either too cold or too warm. Keep in mind that a 6k head in a variable capacity system can only ramp down around 50%, and that's only if other zones are calling. If it's the only zone calling, it's likely to operate at full capacity, depending on the outdoor unit's minimum capacity. In super low load homes in cold climates, it's possible to heat a small open-floor-plan home with a single head (or two heads for two-stories), but the owner must be fully invested in this strategy since rooms away from the head will experience relatively wide temperature swings. In cooling dominated climates, you gotta deliver supply air to the rooms where the loads are, and a ducted system is the only way I know to do that without creating comfort issues. I have run into other problems with ductless systems. One is that all of the air is supplied from one hole on the indoor unit and returned to a hole next to it. That creates direct drafts, especially in cooling, and temperature stratification in heating. As David said, 6000 Btu/hr is too big for some bedrooms, so walk-in closets and bathrooms are pretty much out of the question in terms of cost and sizing. Another issue is that every head needs a condensate drain which can require a lot more installation headaches and maintenance problems. To me, the solution is in between. Don't put in a 5-ton ducted system with lots of ductwork. Put in two 2.5-ton ducted systems with shorter ductwork. I am hoping that someday we will get to the point of putting in three 1.5-ton systems with even shorter ductwork. The air handlers might all be connected to one outdoor unit (or maybe not) and would be hidden in soffits or the tops of closets or the ends of closets or encapsulated in the attic or somewhere that is clever and non intrusive. The main issue is to shorten the ducts, but keep lots of supply registers and returns. Rigid duct is difficult (expensive) to insulate. Flexible duct is insulated, but difficult to properly install (again expensive). I have often combined the two using properly sized rigid duct with a "sock" of flexible duct (1" larger) fitted over the rigid duct. I know, it only works for round duct, but I have used it exclusively for HRV systems where smaller ducts are often all that is required. 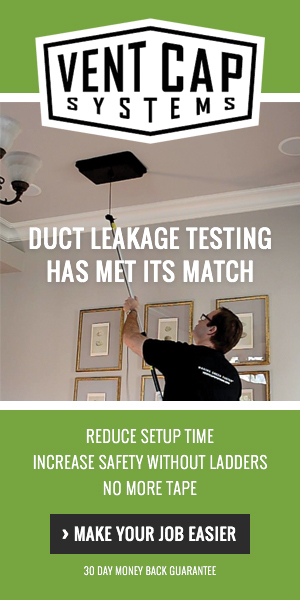 It is easy to install and offers superior performance when and where appropriate. Good points, Thomas. How do you seal the duct when you pull flex over rigid? If you seal the ends of the flex well enough, that should sufficient. This does bring up another good point to ponder between using flex duct and insulated hard duct. Most insulated hard ducting I come across has poorly sealed vapor barriers and/or the insulation is pulled way too tight to be affective. Flex duct at least only has crushed insulation at hangers and connections. Rigid ducts are sealed (possibly in sections) before putting in place. Then the flexible insulated "sock" is pulled over the duct or, if already existing, pushed back to seal the connection before the next pre-sealed rigid section. Generally, I can put the insulated flexible over the rigid in one piece. Remember a 25' flexible duct comes in a 2-3' box. I do tend towards overkill, so I do take care to also seal the ends of the flexible duct, but you may be right that sealing the ends of the flexible could be sufficient without sealing the rigid. I agree with all of your comments, but would like to add that the system that I describe has need for less hangers than flexible alone, as the rigid supports the flexible. The whole system only needs as much hanger support as the rigid alone would require. I believe that using two competing products (rigid & flexible) together provides for a superior system that is probably cheaper (materials & labor) than any other method of providing free-flowing insulated ducting. I have never been happy with the hanging of insulated flexible ducting alone, so I came up with my hybrid method. If the layout is not too complicated, use hard duct for all bends and turns and stretch the straight runs of flex tight and support it properly. Published lab tests some years back by either Oakridge or L. Livermore stated that a fully extended straight section of flex was only 2% below the flow of rigid smooth duct. Thanks for pointing that out, Bob! That was one of my concluding points in the presentation but I had forgotten to put in the article above. I've added it now. Great points, Bob. I'd rather see my clients use flex-done-right than 100% hard pipe given the cost difference. The problem is finding contractors who build flex to impress. The most important criteria: use metal elbows where a gradual bend won't suffice, fully stretching the runs, and use an ample qty of wide non-metalic support straps so as to avoid sags and pinches. In the context of a $10k+ job, the additional time required adds a small percentage to what a botched flex job would cost. It all boils down to training, defined objectives (leakage, static pressure, and hopefully air balance) and rigorous QA. Dave, I have always pushed quality in everything that I endeavor to do including flexible ducting. I have yet to see a flexible duct system that "I" or anyone else has installed, that after "a few years" looks anywhere near impressive for any number of reasons. I won't say that it cannot be done, if you can find the "contractors who build flex to impress", but with my personal experience I have found that my rigid/flex system has provided me with a more achievable and sustainable level of quality. A superior distribution system may initially cost a bit more, but the energy savings over time should make up for the extra cost. Much of my construction experience has centered on finding simple methods to provide a superior and sustainable building product or system. This has always centered around using the KISS principle to minimize the effort it takes for constructors to provide a consistently good (not perfect) product. With the current boom in housing after an extended slump, finding and paying for quality constructors is not an easy task, as many low skilled people are coming into the field and quality is often not one of their attributes. We all need to be open to different approaches to solving the problems presented to us and forums like this certainly provide for great learning opportunities.
" A superior distribution system may initially cost a bit more, but the energy savings over time should make up for the extra cost." Not to belabor the obvious, although that has never stopped me before, but how many installers are concerned about energy costs in a home they will likely never visit again? Present company excepted, I see little incentive for contractors to abandon a "get'er done" attitude, and until a full commissioning process becomes SOP in new construction, I despair much will change in the industry. Perhaps every crew should install HVAC (and in fact, every aspect of a home) as if they were to move their own family in upon completion. I won't hold my breath.